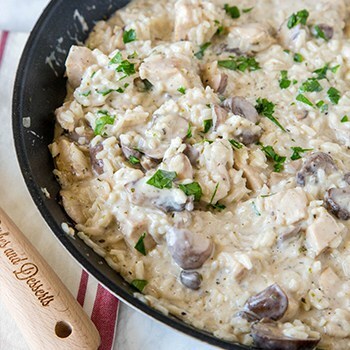 Stovetop Creamy Chicken and Rice is a delicious mix of tender chicken and mushroom with creamy rice. It’s an easy one-pan dinner that’s so easy and great for busy weeknights! When I was growing up, there were a few things that were staples in our house. Chicken and rice casserole was one of them. My mom would mix a can of cream of mushroom soup, milk, rice, and lots of poultry seasoning together. Then, top with chicken breasts and bake until everything was done. I loved the creamy mushroom rice in that dinner. Today, I am making it even better! Skip the canned soup and use real mushrooms and real milk to make this chicken and rice extra creamy and delicious. It comes together in one pan and about 20 minutes, so it is perfect for those busy weeknights! I am a huge proponent of using real milk and dairy. Dairy alternatives tout a nutrient or two, but they don’t measure up to the nine essential nutrients in cow’s milk. Searching for more easy dinner ideas? Try my Yogurt Marinated Chicken or Yogurt Marinated Pork Kebobs. If you haven’t tried using Greek yogurt as a marinade for meat, you need to give it a try—yogurt makes the meat extra tender and gives it a little tang. Heat olive oil in a large skillet over medium high heat. Add chicken, mushrooms, and onion to the pan. Cook for 3-4 minutes until the chicken is starting to brown and veggies are soft. Season with Italian seasoning, poultry seasoning, salt and pepper. Mix well. Stir in chicken stock and rice. Bring to a boil, then reduce heat to medium-low. Cover and let simmer for about 20 minutes until the rice is cooked. Stir in milk and Parmesan cheese. Season with salt and pepper to taste. Serve immediately. On her blog, Dinners, Dishes, and Desserts, Erin shares family-friendly meals even the busiest family can enjoy. Everything from kid-friendly dinners, decadent desserts, snacks and even a cocktail every once in a while. 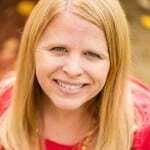 Erin grew up in the Midwest but now lives with her husband and son in Colorado. They enjoy spending time playing in the mountains year-round.